Those who attended Chevy Chase Junior College in the early 1920s had many opportunities to visit historic sites throughout the nation's capital while they completed their education. On a memorable visit to Mount Vernon, the Chevy Chase girls had the good fortune to meet General John J. Pershing, a hero of World War I. In a short memoir about the meeting and the ensuing invitation to tea, Clair Rountree Price, class of 1922, tells readers about the girls who attended the school in the early years of its operation. Chevy Chase School for Girls, as Clair Rountree (later Price) remembers it in the 1920s, was known for its excursions, including trips to Mount Vernon by boat. Chevy Chase girls, though accompanied by the “inevitable chaperone,” had a particularly exciting moment as they began a tour of the famous home, for just ahead of them was General John Pershing, leading a delegation of foreign visitors to George Washington’s home. A crowd quickly surrounded the famous general, and an amateur photographer asked if he could take a photo. 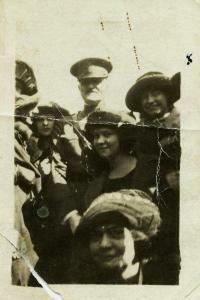 The general replied, “Certainly, if you will let me stand between two of those attractive young ladies.” Clair Rountree was one of those lucky girls, and a few days later, they received the negative of the photo that captured this moment: the General is surrounded by smiling Chevy Chase girls in their 1920s style cloche hats. General Pershing with Chevy Chase Students, taken by an unknown amateur photographer. Clair Rountree is on the right, by the small "x." To the girls’ delight, a formal invitation from General Pershing arrived a few days later, inviting all seventy students at Chevy Chase School for tea. On the day of the tea, all the girls hurried about the school in preparation for this most anticipated event. Attempting to look their best, each girl borrowed an item of clothing such as a hat or pocket book from someone else, believing they couldn't possibly set out in an outfit all their own. 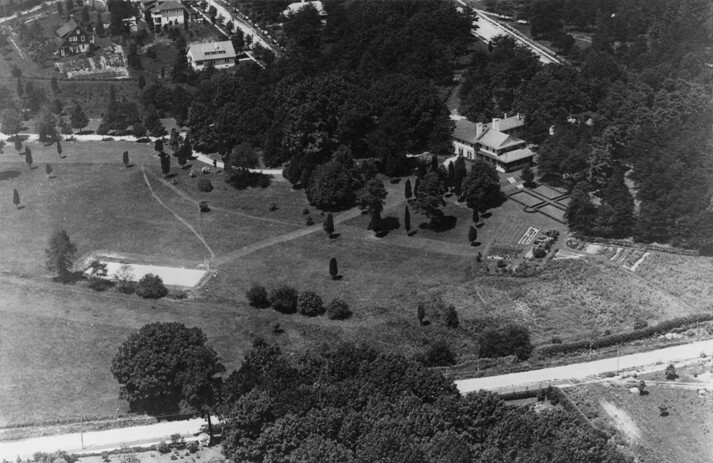 Aerial photo of General Pershing's Home in Chevy Chase, Washington, DC. "We thought we were ravishing but I now have no doubt that everyone of us would have looked better had we worn our own clothes so carefully chosen a few weeks earlier by doting mothers before we set out for boarding school." The event itself was a huge success, and General Pershing was a gracious host. Clair Rountree remembers how he moved from group to group, engaging each girl with a personal anecdote about their hometowns. As it goes with most noteworthy occasions, Clair Rountree could not remember what was actually served for tea, but her story lived on being told and retold for her children and grandchildren. Clair Rountree Price’s memory of meeting General Pershing provides us with a young woman’s view of the famous general in the years right after WWI. But just as interesting is her portrait of Dr. Farrington, the headmaster at Chevy Chase from 1917 to 1930, as he counsels the girls not to raise their hopes too high on the chance of receiving a formal invitation to tea with the general. There is a kindness beneath Dr. Farrington's stern countenance in Clair's memoir. The close proximity of Chevy Chase School to Washington, D.C. and the powerful figures who lived and worked there would be influential in the school's development over the course of almost fifty years.